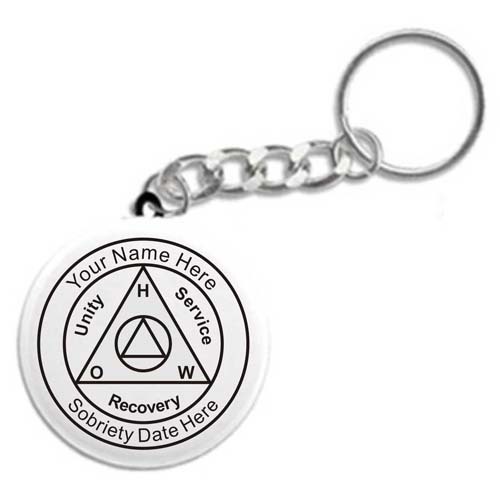 Personalize this super cool recovery keychain with your name and sobriety date! A unique recovery gift for anyone celebrating milestones in recovery! Please provide the NAME exactly as your would like it to appear on your keychain. Please provide the Sobriety DATE in the format that you'd like on your keychain. Our button-style recovery keychains are not imported or mass produced. Each keychain is carefully and lovingly created by hand, one-at-a-time, by your whacky pals at WoodenUrecover! All keychains are individually created and quality checked. Graphics, text, and photos are color laser printed on only the highest quality substrate. The .003" mylar covering makes each recovery keychain UV and water resistant. Our methods ensure that your keychain will remain vivid in appearance and last for years and years! Q: I would like to know if it is possible to engrave something other than an actual name and date such as Name would read: Greenwood Group Date would read: Class of 2011 Is this format possible for the keychain? On ANY of our personalized products, there is always flexibility with the text fields. Special messages, etc. can typically be substituted for the Name/Date fields as long as the message doesn't get too terribly long. Your substitution of "Greenwood Group" and "Class of 2011" is very doable! Please reach out if we can offer additional assistance!